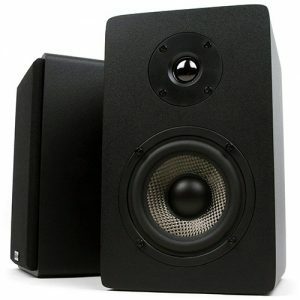 So you’re on a tight budget and want to buy the best bookshelf speakers under 100 bucks that you can get your hands on. With so many options available it’s hard to know where to start and what exactly to spend that hard-earned cash on. We’ll you’ve come to the right place – we’re audiophiles on a budget and here to ease your pains and wows. Let’s get down to business. Firstly, what can you expect to get in this sub $100 price bracket? Ten years ago you might have struggled to get decent set speakers of any kind for less than $200, never mind $100, but these day’s, with mass production and components at low prices you can get some surprisingly good kit. What you won’t get is super-high end components, solid wood finishes or bells and whistles, but there are certainly some awesome speakers available under $100. If you’d like to jump straight in, we’ve shortlisted our best bookshelf speakers under $100 below. There’s not quite as many as you’ll find in our “under $200” and “under $500” lists, but we’ll keep growing it as new speakers are released. Each has an overview and pros / cons. Click through to see what other buyers have to say on Amazon, or read our full length review. Below are our list of top speakers you can grab today for less than $100 bucks a pair…we’ll have full reviews for each speaker coming soon. Watch this space. We liked these speakers so much they even made it onto the “under $200” list.Complete with remote control, bass and treble control this pair of active speakers give you a full setup for just under $100. They offer dual auxiliary inputs with no switching, a sleek wooden design and remote control. This stereo pair offer detailed and well-balanced highs, midrange frequencies that provide well-reproduced, natural vocals and acoustics alongside a pretty decent bass response suitable for a variety of mainstream music. Should you close your eyes and listen to these little beasts, you might even mistake them for high-end speakers. 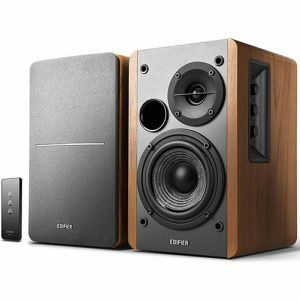 The Edifier R1280T speakers offer surprisingly natural sound reproduction with some minor distortion occasionally sneaking in on the low bass, but at this price and size what can you expect? Although this speaker doesn’t present much of an upgrade over its predecessor, the MB42, when it comes to aesthetics, it’s still a fairly elegant speaker that would blend flawlessly in any environment.As far as the music-producing components go, the Micca MB42X comes with a .75-inch silk dome tweeter that’s placed in a simple waveguide and a four-inch balanced carbon fiber woofer that sits comfortably in a rubber surround. When it comes to performance, Micca’s bookshelf speakers prove that they’re well-worth their place on our list, as they offer a powerful picture projection with a slight dip in the midrange and a noticeable depression in mid-range bass. The trebles, on the other hand, are a bright, and the lower end is nothing but weak, all thanks to the 18dB/Octave crossover, which is the major upgrade over the MB42 speakers. In a nutshell, for the price, the Micca MB42X works well, and it’s durable enough to last for many years to come. If you want to step into the audiophile scene without blowing a hole in your wallet, the Micca MB42X might just be the best bookshelf speaker for you. 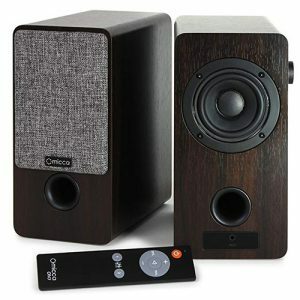 The Micca ON3 Bookshelf Speaker is one of our top picks in the budget-oriented product category. With a price that sits below the 100 bucks, you’ll be blown away the quality you’re getting. The ON3 speaker pair is compact, stylish, and produces decent sound quality for the price. If you’re on a budget, this is the bookshelf speaker for you. It may not have faired quite so highly as the others in this category but certainly do not dismiss it, especially if you are short of space. The ON3 certainly offers bang and style for it’s buck — just not quite so much bang as the others! So what should you be looking out or when trying to find the best bookshelf speakers under $100 or any bookshelf speaker for that matter? Do you know what specs matter or how your home setup and furniture might influence the sound? Here’s a quick guide to get you started. Firstly, bookshelf speakers are meant to sit at ear-level, which is why they are to be elevated at all times and never placed on the floor. If you cannot place it on a bookshelf or similar surface, then you can find bookshelf speaker stands on Amazon or wall mounts. Just don’t set them on the floor. Seriously. Why? A bookshelf speaker has two drivers – a woofer and a tweeter – which are designed to produce both high and low tones, but the woofer is quite small and so the bass is less than what you would get out of a larger speaker. Bass carries; that’s why you can set your sub on the floor. Mids and higher tones don’t carry so well. That’s why these speakers need to be placed high – so the sound can carry and remain clear. Have you ever been at a concert or a nightclub where there are some speakers on the floor and some hanging from the roof? The ones on the floor are the bass bins or subwoofers, the ones hanging high in the air are speakers for the mids and highs, so they can carry sound over the crowd. You may not be an audiophile or audio junkie and so the tech stuff on the speaker may not be your cup of tea, but some terms are handy to know when buying the best piece of kit for your home. Sensitivity – Measured in decibels (dB) is essentially the loudness or volume of the speaker. A whisper is around 15dB, normal talking or low volume music is about 60dB and concert is around 110dB. Anything above 85dB can cause damage to hearing. Hertz – This is the frequency with which a state of sound wave changes and is given as a range from low to high. The lower the “low number” is, the deeper the bass that can be delivered and the higher the “high number” is, the higher it can deliver. A human can generally hear as low as 20Hz (deep bass) and as high as 20kHz (a piercingly high frequency). Impedance – this is resistance, measured in ohms (symbolized as Ω). The higher value the more resistance and the lower the least resistance. Essentially a low resistance speaker will allow more electricity through it and thus potentially be louder. Impedance of speaker and amplifier need to be suitable so they work together. You might see an amplifier that states it can give 100Watts of power at 8ohms, but would deliver 150Watts of power at 4ohms. This is only really for the true audiophilze though; these bookshelf speakers will all sit at 6 – 8 ohms and be compatible with most amps. Watts – how much power your speaker can take and thus loudness. Look for the RMS figure which is “continuous power”. Peak power is often double the RMS figure and should be avoided when comparing speakers. Drivers – There are two drivers in a bookshelf speaker (and many other speakers); a woofer for bass and a tweeter for high-frequency sound. You can buy separate bass speakers called subwoofers. You may be tempted to go for the smallest speaker out there, but it’s generally better to go larger if you can. Usually the bass sounds are improved. Similarly, make sure you know where you are positioning your speakers – if they are too big, they might not fit on your bookshelf. Be sure to check out the dimensions. Powered (Active) or Passive Speakers? Most bookshelf speakers are passive, meaning that the sound passes through an amplifier (which you’ll need to buy separately). Powered speakers, also called active speakers, don’t need an amplifier as the amp is built into the speaker unit. Currently most audio enthusiasts still prefer passive due to the quality and flexibility. If you’re looking for a party speaker more than a home theater or audiophile audio setup, Bluetooth connectivity might be something you’d be looking for. These tend to come with some newer active speakers, portable speakers and soundbars, however as they are generally less suited to those seeking bookshelf speakers, we won’t be covering them here in depth. Touching on what we mentioned before about speaker dimensions, you also want to consider the size of your room. If the room is large, you will benefit from more powerful speakers with deeper frequency range. However, as we also mentioned earlier, you could purchase a subwoofer to enhance the bass. We generally only recommend establish brands when it comes to sound, speakers and electrical goods. We find established brands perform much better, not just in their sound and performance but in aftersales and warranty. You’ll often find brands offering 5 year warranties on their passive speakers – that’s how confident they are. If you manage to find a cheap unknown brand though do let us know! Don’t settle for the first bookshelf speaker you see online as there could be others out there with better specs and lower prices. Read through our reviews and opinions of the best bookshelf speakers under $100 that we could find and see what others have to say on Amazon. Got a few extra quid to spare? There are a lot more options if you can increase your budget just slightly, check out our best bookshelf speakers under $200 for more reviews.